Note: Part 2 in a series on better email communication. Write better, get better results. Here’s Part I. 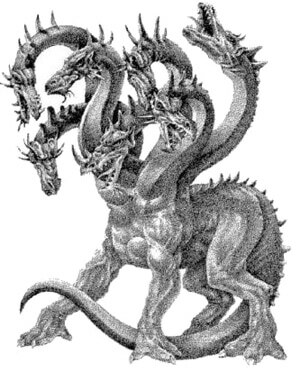 That beast above is called Hydra, a multi headed creature from Greek mythology. It was said to possess the ability to grow back any of its heads that happened to be cut off, and could spew poisonous fumes at its enemies. Hercules figured out that if you cut off all the heads and then burn the remaining stumps you could kill it. Sounds a bit far fetched to me, but the story doesn’t go into how fast the heads grow back, or how he actually burned the stumps. Thats Greek Mythology for you, I guess. In my last article I discussed keeping your emails to one point, but what happens when you get a Hydra like email, with so many points you can’t tame them all? What most people do in these situations is to simply hit ‘reply’ or ‘reply-all’ and start typing away. For people who are concerned about effective email communication, the answer is almost as simple, but much more effective. Taking the One point to rule them all rule, the idea is to have a point to make, and answer only that point. And to reply only to that one point. In most desktop email clients this is easily accomplished by highlighting the part of the email you are answering, and then hitting reply. A reply message window will open with only the highlighted text in the body, with a nice header above it stating the name of the person who originally sent the email, and when they sent it. Your reply is then typed in, keeping the entire email short, sweet, and concise. The only thing the recipient will have to read through is your reply and the pertinent part of their original email. All the extraneous stuff like signatures and unnecessary text and 10 other points are left out. Nice job, Hercules. For extra credit, I’d also suggest you start using the technique known as ‘bottom posting.’ I’ll save that for next week. I suggest bullet pointing your responses for Hydra emails.